A quick recipe that is delicious and easy to make, perfect as an appetizer or a main entree. Cut a lid from the onions and chop finely. Hollow out the onions. Pour 13 oz. of broth into a large pot with enough water until liquid is about 1 in. high. Add onions and cook covered for about 10 min. Peel potatoes, dice and cook for 20 min. in a pot with salted water. Remove onions from pot and set aside, in the large pot combine onion broth, vegetable stock, cream cheese, salt and pepper to taste. Cook onion mett on a skillet with oil add onions, stir tomato paste, broth and simmer until the liquid has evaporated. Mash the potatoes, add the milk and season with salt and nutmeg. Fold in the mett and fill the onions with the mett and potato mixture. Sprinkle with cheese. 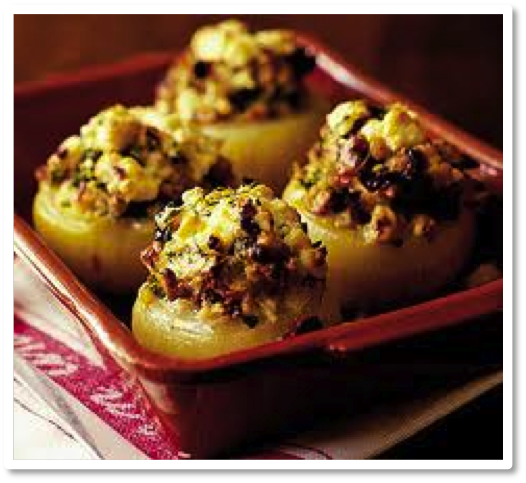 Place the filled onions in a casserole dish and bake for 20 min. at 350F.